I'm using MVC, and have set up the data model to use remote filtering, paging, grouping and sorting. The controller is set up as follows. Please note that the method GetLinqPagingGridModel simply returns a suitable grid model with the DataSourceUrl set to the LinqInfragisticsGrid action method. The DataSource property for the GridModel doesn't get set. // Returns the data model as an IQueryable object (required by the grid's data source). Any thoughts on what I'm doing wrong? 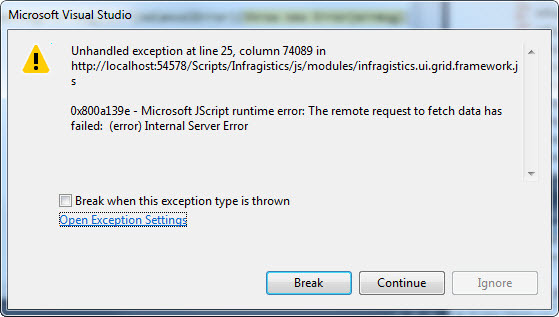 I'm not getting any errors when I get the data from a stored procedure. In internet explorer, press F12 to get the developer tools. Now choose network and start capturing. Refresh the page in your browser. Double click this and now choose the response body tab. There is likely to be an HTML error message telling you what really went wrong.